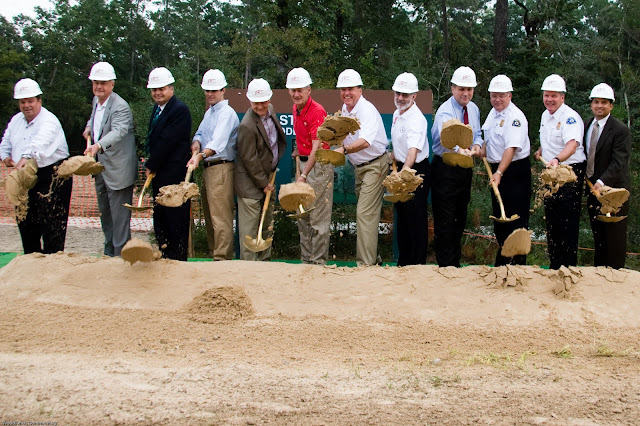 The customary ground breaking ceremony occurred today for The Woodlands Fire Department in Montgomery County Texas at the new location on Gosling Road. 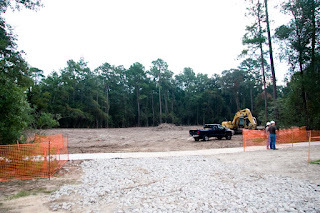 Although not the first real movement of dirt, it was nonetheless, very important to residents of Indian Springs, Panther Creek and the Village of Creekside Park. The Woodlands Development Company, Township directors, Woodlands Fire Department, Woodlands Association (past), Joiner Partnerships (design) and Teal Construction were represented to toss the first shovel of dirt. In approximately 10 months, the first response to an emergency call will be deployed from this station. Cost for design was about $400,000 and for construction will be approximately $2.3 million. 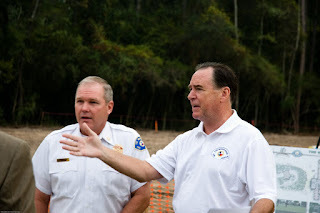 Depending on the weather, availability of materials, etc, we should see the station fully functional in July of 2011, providing emergency fire fighting and EMS services. There will be three bays, one with a ladder truck, one with an pump truck and the other with an EMS vehicle. 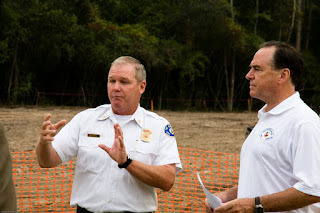 This will be a conventional 24/7 operation from a location where the department will provide a 5-minute average emergency response to residents and businesses in the three closest villages - Panther Creek, Village of Creekside Village and Indian Springs Village. Currently parts of Indian Springs and Panther Creek have an 8-minute average response. Five minutes is The Woodlands standard. 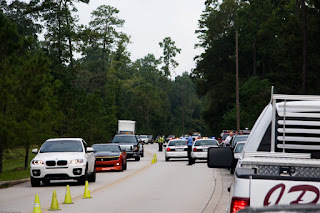 To meet that objective, the traffic light at Gosling and Flintridge is one of our challenges. It is not expected to be a problem, says Fire Chief Alan Benson. The light will be equipped with a green light emergency switch that is activated by the truck to clear the needed lanes of congestion. There are four lanes at the light for north/southbound traffic. According to the chief, that combination should clear the traffic even at peak traffic hours in the evening. An interesting consequence of building this new station is the entrance issue. 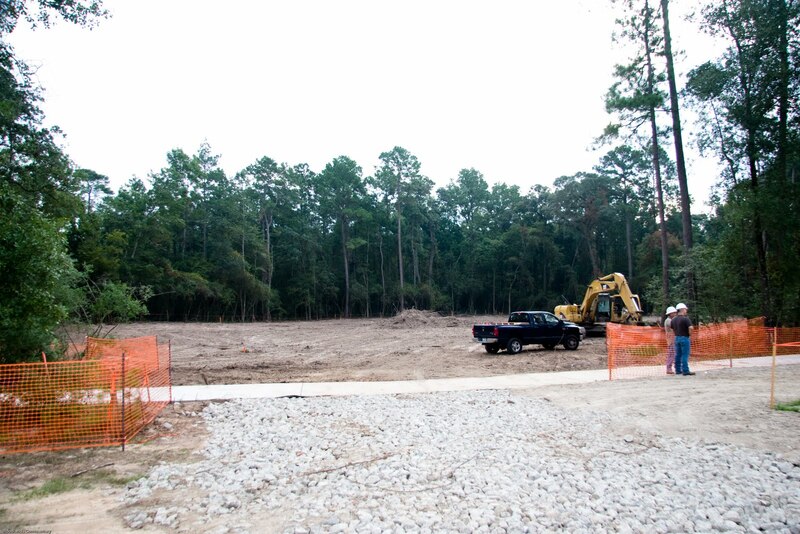 The pathway joining Indian Springs, Panther Creek and Creekside has not been opened yet. Construction of the fire station will apparently preempt its opening. The pathway to the bridge over the creek on Gosling is needed for safety as soon as possible, especially for biking purposes. For noise, there is a great deal of timber left all around the station that is mostly evergreen. However in one area, when the leaves fall, the quiet of the still cold air will be interrupted by the noise of traffic and some noise from the station itself when there are emergencies. At one point in the ceremony, a diesel truck passed by, completely drowning out the speaker.